Diaspark’s Content Management Services enable simplified capturing, storage, management and delivery of content with the right technologies to improve complete digital lifecycle management. Our content management services empower businesses with end-to-end visibility into content for delivering superior customer experiences to customers. Our consulting services are aimed at assisting our clients with the complete roadmap and strategy for implementing content management across their businesses. Our team of experts work closely with clients to increase audience outreach by integrating their complex and unstructured content into one single content management system. Our workflow management processes aid businesses with end-to-end integration of workflows to achieve higher operational efficiencies. 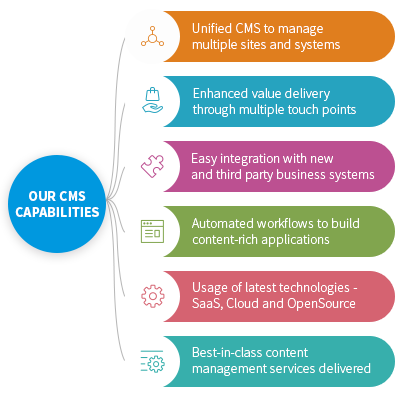 Drupal is a leading open source CMS that provides compelling user experiences across multiple channels. We, at Diaspark are well versed with latest Drupal versions and its functionalities to deliver feature-rich websites for personalized customer experiences. Our Drupal Services include Drupal Customization, Drupal Development, Drupal Upgrade, Drupal Maintenance and Drupal Migration. We are a certified Sitecore Partner – specializing in developing, managing and implementing end-to-end personalized & contextual digital experiences. Our three decades of experience in technology and digital transformation along with Sitecore partnership will help you position yourself as a strong powerful brand to drive engaging personalizing, engaging and superior customer experiences. WordPress is an open source content and blogging platform with plenty of easy customizable features. We, at Diaspark help businesses with innovative and state-of-the-art wordpress customizations with services including WordPress Development, WordPress Enhancements, WordPress Migration and WordPress Maintenance.